Does it also make you feel uneasy to think that bulldozers can destroy the land where citizen soldiers gave their lives if we didn’t work together to stop them? As you know, for years we have worked together with you to save hallowed ground from development, and we look forward to continuing to work with you to be on the forefront of battlefield preservation for years to come. If you want to ensure that the Civil War Trust will be around for many more years saving this important hallowed ground, would you consider putting the Civil War Trust in your will or other estate plans? Including the Civil War Trust in your will is easier than you may realize, I encourage you to explore our free online resources or contact our planned giving office to find out more. 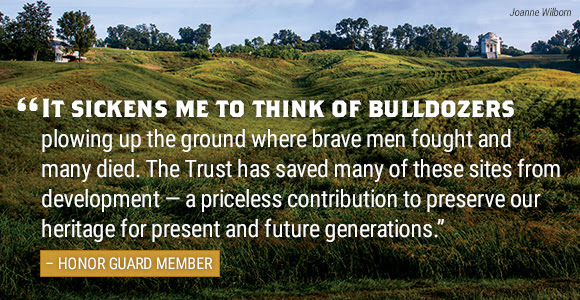 Thank you for all you do for battlefield preservation. Have you already included the Civil War Trust in your estate plans? Please let us know so we can welcome you into our Honor Guard legacy giving society. We encourage you to complete our online Declaration of Intent. Explore the options for including the Civil War Trust in your estate plans to find the one that works best for you. Legacy gifts through your estate help the Civil War Trust significantly when saving land, but cost you nothing right now. Over 1,000 people have already included the Civil War Trust in their estate plans, please consider joining the Honor Guard too. Did you know you can give to the Civil War Trust directly through your Donor Advised Fund on our website?